The Scaer surname has been spelled several ways over the years. Spellings include Scaer, Scare, Scarr, and Skahr. John’s brother Peter changed the spelling to Scare for his branch of the family. John and Elizabeth were my great-grandparents. 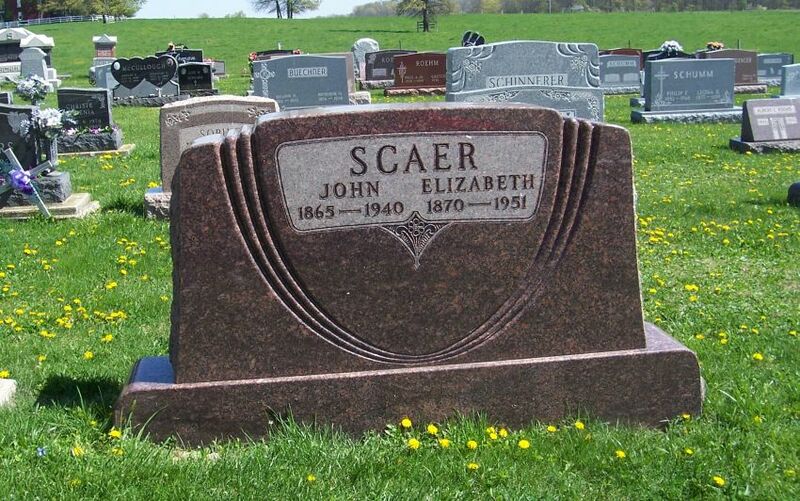 John Scaer was the third of five children born to Johann and Katherine (Emrick) Scaer. [He also had an older adopted step-sister, Elizabeth, from his mother’s first marriage.] 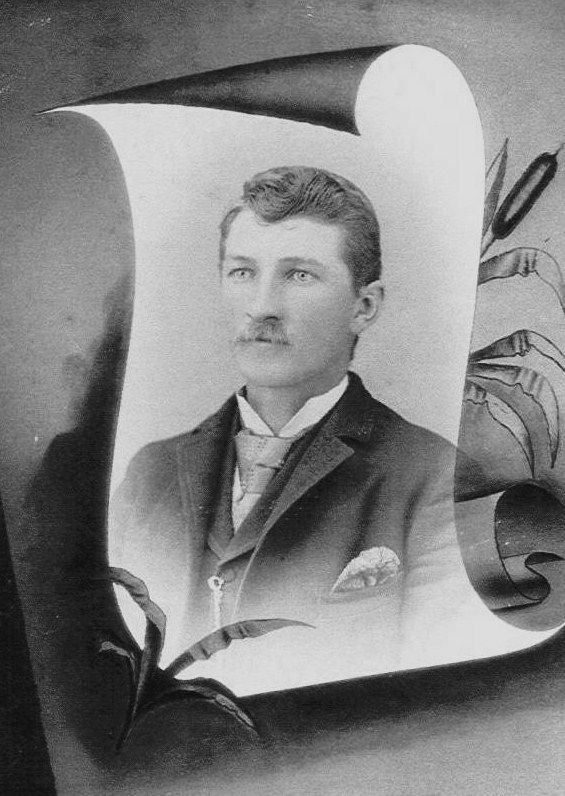 John was born 1 May 1865 in Tuscarawas County, Ohio. His parents were born in Germany and his father immigrated with his family about 1839. The family first lived near Winesberg in Holmes County, Ohio, before moving to Tuscarawas County. They eventually moved to near Monroeville, Allen County, Indiana, in about 1867. 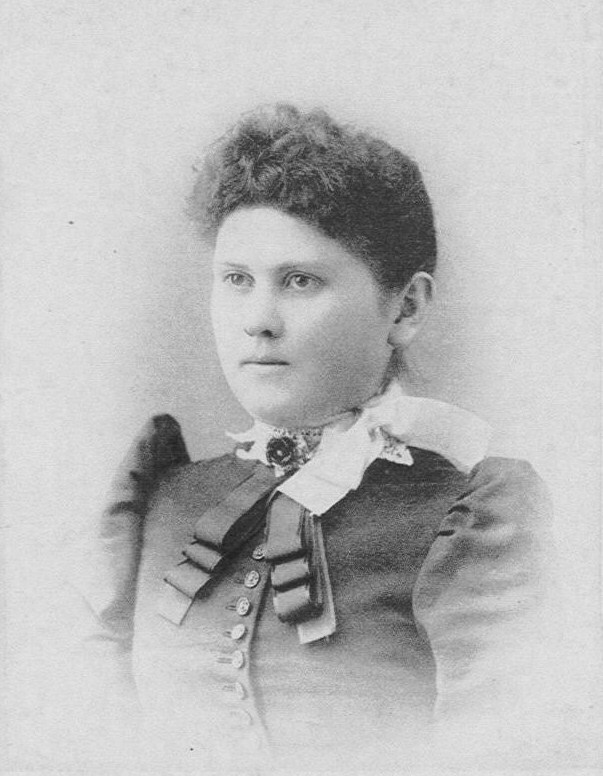 Lizzie was the sixth child born to Friedrich and Elisabeth (Schumm) Schinnerer, born 23 April 1870 in Dublin Township, Mercer County, Ohio. John & Elizabeth (Schinnerer) Scaer, 1894. People usually found a spouse within three miles of their home, but John and Lizzie’s marriage did not adhere to that rule. The Scaers lived near Monroeville and the Schinnerers lived near Willshire, a distance of roughly 20 miles. John’s brother Peter married Lizzie’s sister Hannah in 1890 at Zion Schumm. I can see how John met Lizzie, since their siblings Peter and Hannah married, but I wonder how Peter and Hannah met. I would not be surprised if they met at a church-related function. The Scaers lived a couple miles east of Willshire on Willshire Eastern Road. Their first home was a frame house but they later built a brick home that still stands today. Their home was the next house east of Ludwig Schumm’s home. John and Lizzie’s daughter Hilda would eventually marry Ludwig Schumm’s son Cornelius and they were my grandparents. 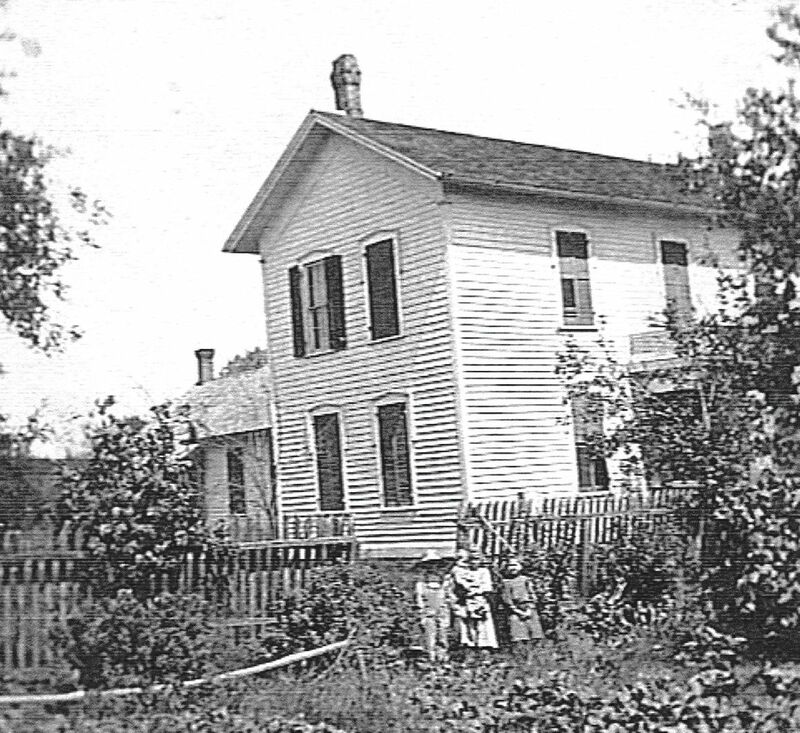 John Scaer home east of Willshire, c1904. Willie, Elsie, Hilda, Edna Scaer. John passed away 2 February 1940. Lizzie had a stroke about three years later and was confined to a wheelchair after that. She continued to live at her home with her son Oscar. Oscar never married and took care of her until she died on 28 October 1951, after suffering another stroke. Oscar resided in the Scare home place the rest of his life. John and Lizzie are buried next to their son Oscar. John Scaer, a well known and highly respected farmer, east of Willshire, died in the Decatur hospital Friday morning, Feb. 2, at the advanced age of 74 years, nine months and one day, following an extended illness. Mr. Scaer was taken to the hospital about a month ago, suffering from serious complications. He underwent a major operation in the hope of prolonging his life, but the surgery was unavailing and he passed away Friday. He was born in Baltic, Tuscarawas Co., OH, on May 1st, 1865, where he was also baptized. A few years later the family came to live near Monroeville, IN, where Mr. Scaer was admitted to membership in the Lutheran Church by confirmation. 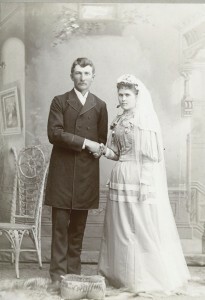 In 1894 he was joined in marriage with Elisabeth nee Schinnerer. This marriage was blessed with five children, of whom four are living, one son having preceded him in death in 1906. In 1904 Mr. Scaer settled on the farm a few miles east of Willshire, where he was residing when summoned by death. 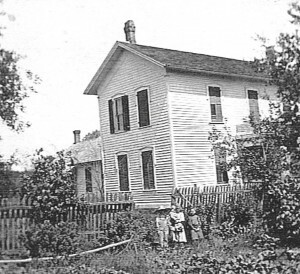 The immediate family mourning his death are the following: His wife, Elisabeth; his son, Oscar, still at home; Mrs. Cornelius Schumm, Mrs. Emanuel Schumm and Mrs. Paul Roehm, all residing within a few miles of the old homestead; nine grandchildren and one brother, Peter Scaer, residing near Schumm. A stroke proved fatal to 81-year-old Mrs. Elizabeth Scaer, who died Sunday morning at her home two miles east of here. She had been an invalid for eight years. The deceased was the daughter of Frederick Schumm-Schinnerer, was born April 23, 1876, and was married to John Scaer April 15, 1894. 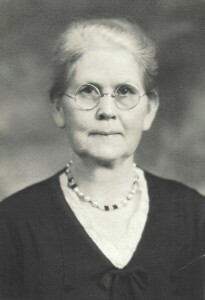 Her husband died February 2, 1940. 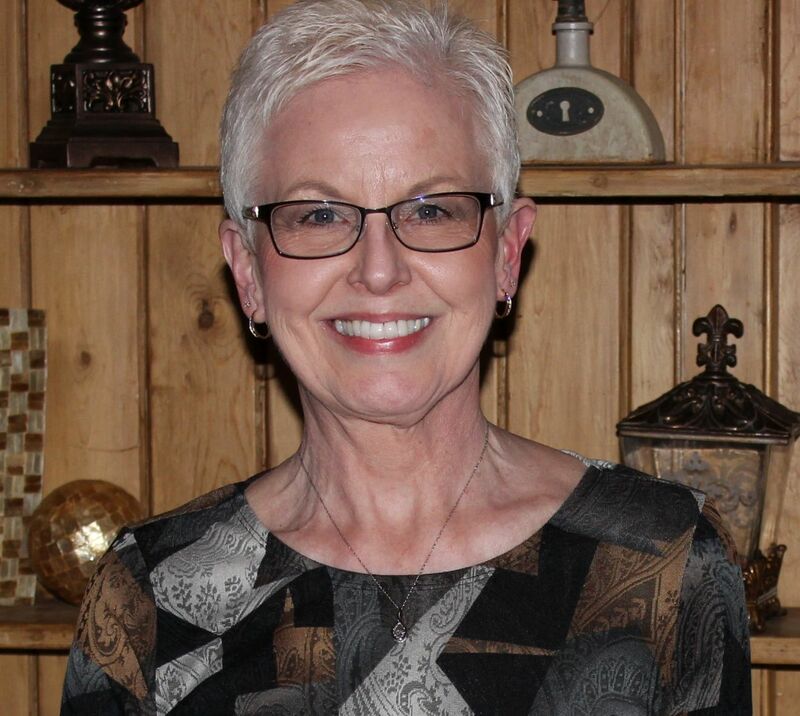 She was a member of Zion Lutheran Church at Schumm. Funeral services for Mrs. Elizabeth Scaer, a long-time resident of Willshire Township were conducted on October 30 with Rev. 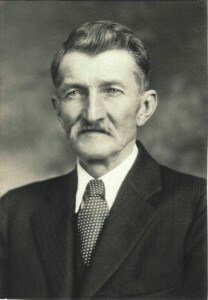 Werner P. v.Kuhlberg officiating and with Zwick Funeral Home of Decatur in charge. Brief services were held at 2 p.m. at the home with only the immediate relatives and close friends of the deceased in attendance. From there the body was taken to the Zion Ev. Lutheran Church at Schumm to which Mrs. Scaer belonged as a member during her lifetime. The funeral address was based on Psalm 42, v.11, the memory verse selected for her by Pastor Seemeyer at her confirmation. A well-represented congregation testified to the high esteem in which the deceased was held in this vicinity. A view of the remains concluded these services and the body was carried to the church cemetery for interment. Elizabeth Katherine Scaer (nee Schinnerer) was born on April 23, 1870, in Mercer County to Frederick Schinnerer and his wife, Elizabeth (nee Schumm). A little later the family moved into Willshire Township and she was confirmed at Zion Ev. Lutheran Church on Palm Sunday April 28, 1884, which also happened to be her fourteenth birthday. Her memory verse on the occasion was the last verse of the 42nd Psalm, and this verse also served as the text of her funeral address. This Psalm was one of the favorite ones for her. 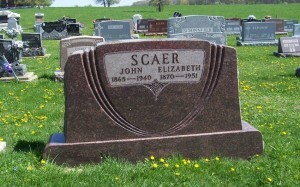 On April 15, 1894, she was married to John Scaer of this community, who preceded her in death on February 2, 1940. Their almost 46 years of happy union were blessed with five children, of which one son died at the age of nine. The other children are still living in the community: Mrs. Cornelius (Hilda) Schumm, Mrs. Emanuel (Edna) Schumm, Mrs. Paul (Elsie) Roehm, and Oscar, who resides on the farm of his late parents. Besides the above mentioned children, she leaves to mourn her one brother, Henry Schinnerer on the farm just outside of Willshire, as well as three sisters: Mrs. Hannah Scaer, mother of Mrs. Rudy Allmandinger, with whom she makes her home; Mrs. Emma Balyeat of Altadena, CA, and Mrs. Amelia Hoffman, wife of T,D, Hoffman of this community. She is also survived by nine grandchildren, of whom one, Paul Roehm, Jr., serves his country on the battle fields of Korea. After a lingering illness of over eight years, she fell asleep rather unexpectedly at 5:45 on Sunday morning, October 28, on the day she had expressed her desire to participate in Holy Communion with the rest of the congregation. Lester W. N. Scarr, A short History and Family Tree of the Scarr/Skahr Family, (No place : privately printed, no date), 11, 21. “Ohio, County Marriages, 1789-1994,” index and images, FamilySearch (https://familysearch.org/pal:/MM9.1.1/XD26-8HC : accessed 16 Feb 2014), John Scaer and Lizzie Schinnrer, 15 Apr 1894; citing Van Wert, Ohio, Marriages Vol. 8:287 #864, United States, reference 864; FHL microfilm 1015862. They were married by Rev. G.F.C. Seemeyer, pastor of Zion Lutheran Church, Schumm. “United States Census, 1900,” index and images, FamilySearch (https://familysearch.org/pal:/MM9.1.1/MMBW-YV9 : accessed 16 Feb 2014), John Sear, Monroe Township, Allen, Indiana, United States; citing sheet 2A, family 28, NARA microfilm publication T623, FHL microfilm 1240358. “United States Census, 1910,” index and images, FamilySearch (https://familysearch.org/pal:/MM9.1.1/MLJ3-T3J : accessed 16 Feb 2014), John Scarer, Willshire, Van Wert, Ohio, United States; citing sheet 3A, family 56, NARA microfilm publication T624, FHL microfilm 1375251. The Willshire Herald, Willshire, Ohio, 8 February 1940, p.1. The Willshire Herald, Willshire, Ohio, 1 November 1951. The Willshire Herald, Willshire, Ohio, 8 November 1951. The names and that big old brick house bring back memories from childhood. My folks knew Oscar and I know he helped them out at least one time in a big way. Remember pulling in the driveway and seeing that big brick house when very small (although probably not considered big by modern standards, it was special to me then). I’d never thought specifically about the fact that people tended to find a spouse within three miles of their home, but of course, it makes perfect sense! It would be fun to map out where ancestral couples lived in the years before their marriages to see how close their farms/villages/neighborhoods really were. That would be an interesting project. I really believe the 3-mile rule, but it would also be interesting to see the percentages of that in a family and how it changed over the years.